There are many different certificates out on the market today, however the European Union has developed one system that applies over all the EEA countries, its called The CE marking system and it is an acronym for the French "Conformité Européenne". The CE marking system is a mandatory conformity mark that exist on products placed on the single market in the EEA area (European Economic Area). The CE marking purpose is to certify that a product has met EU consumer safety, health or environmental requirements. When using the CE marking, the legal responsible person for the product (often manufacturers), assert that the item has met the essential "Health and Safety" requirements of the relevant European Directive(s) that provide for the CE marking. This may include low voltage equipment, medical devices, toy safety or in this case windows. Residences of the following countries can use the CE marking to see if their windows have met the mandatory requirements: Austria, Belgium, Bulgaria, Cyprus, Czech Republic, Denmark, Estonia, Finland, France, Germany, Greece, Iceland, Hungary, Ireland, Italy, Latvia, Lithuania, Lichtenstein, Luxembourg, Malta, Netherlands, Norway, Poland, Portugal, Romania, Slovakia, Slovenia, Spain, Sweden, Switzerland and the United Kingdom. There are other certificates and markings for windows around the world but unfortunately none of them are international. 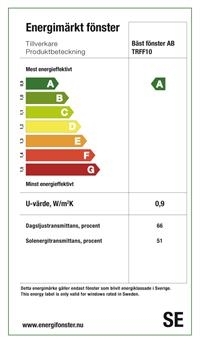 In Scandinavia there is a project called EQ marking which stands for Energy efficient Quality Windows. This project between different window manufacturers to put a value on triple glazed windows so consumers easily can asses how energy efficient a window is. The scale runs from A-G (See picture).